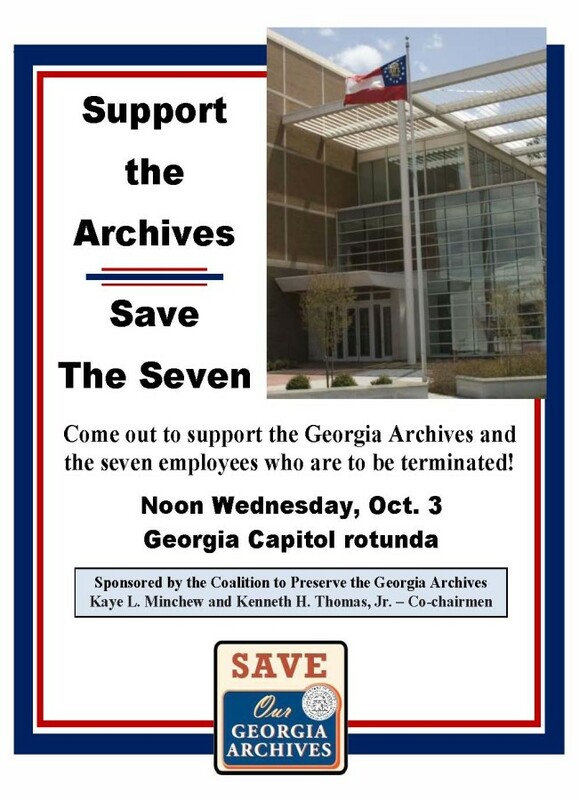 Tomorrow, Wednesday, October 3, 2012, at noon, Georgia residents committed to the effort to save the Georgia State Archives and its few remaining staff members will rally for one hour at the Georgia Capital Rotunda in Atlanta. If you’re anywhere near Atlanta tomorrow, The Legal Genealogist urges you — no, I beg you — to turn out and support this cause. The event is being sponsored by the Society of Georgia Archivists (SGA) and the Friends of Georgia Archives and History (FOGAH), on behalf of the Coalition to Preserve the Georgia Archives. And they need our help, yours and mine. No matter what you’ve read, no matter what you’ve heard, as of this moment, there is no deal to keep the Georgia Archives open past the 1 November date when Georgia Secretary of State Brian Kemp said he would run out of money to keep it open. Yes, I know that Georgia Governor Nathan Deal has made comments that support keeping the archives open, but he hasn’t put a single penny on the table. So make no mistake about it. 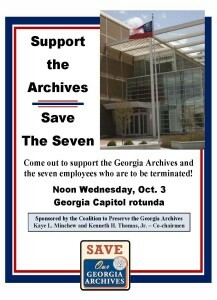 If nothing changes, and changes dramatically, the Georgia Archives will close to the public on 1 November 2012. Oh there are some promises to allow access by appointment. Sure. With a grand total of — count ’em — three staff members. Three. The other seven people who work there now have been given pink slips effective at the end of the month. Once upon a time there were more than 50 people who worked at the Archives. That’s been whittled down and whittled down until there are now only 10, and seven of them are about to be let go. The loss of those seven will be devastating. Devastating. There’s no other word for it. If you have even a single doubt about what it means, read the blog post at the Georgia Archives Matters blog, The Staff – What We Stand To Lose. And when those seven are gone, just how likely is it that three people — the Archives director, one archivist and a building superintendent — are going to have time to handle public appointments? Right. Pigs may fly first. Now I understand that we don’t all live in Georgia. But we are all affected by what happens in Georgia. And we simply can not afford to let a state as important to genealogy as Georgia walk away from records access. So whether we live in Georgia or not, let’s all make a pact. Let’s give the Georgia Archives one hour tomorrow. For those who live in Georgia, I implore you — turn out in force tomorrow at noon. Hire a babysitter (better yet, bring the kids! it’s their future that’s at stake!). Take the day off from work. Get up early and drive to Atlanta. Swell those numbers at the Capitol Rotunda. Make it so that nobody in State Government can even try to say that closing the Archives doesn’t matter, that people don’t care. For those Georgia residents who just can’t make it to Atlanta at noon, take that hour and write letters and emails. There are some great ideas at the FOGAH website about what needs to be said now, in the 1 October Status Report. Remember: there’s an election in November. As Georgia citizens, you’re in a unique position to remind the members of the Legislature that you’re a genealogist and you vote. And that how you vote is very likely to depend on what your legislator does about this issue. For those of us whose ancestors are from Georgia, we need to take that hour as well. Okay, maybe we can’t vote in Georgia elections. But we can make it clear to the elected officials there that one thing we do have is a commitment to research. When we research, we travel. And when we travel, we spend money. In their districts. With their local businesses. Their local hotels and restaurants and souvenir shops (not to mention their local museums, historical societies and more). So write letters. Send emails. Introduce yourself (and your ancestors) and tell these folks why the Archives being open is important to you. And find out more about what needs to be done at the FOGAH website or its Facebook page. 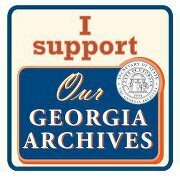 At a minimum, if you haven’t already done so, sign the online petition to keep the Georgia Archives open. And don’t just sign it — add a comment explaining why it matters to you. Yes, time is something we’re all short of. And yes, I’m asking you for an hour that may be hard to carve out of your busy schedule. But it’s just one hour out of our lives tomorrow. The pay-off could be a lifetime of records access. the History and Geography Club at Columbus State University is having their rally in support of the Georgia Archives on campus at noon on Wednesday October 17th in front of the CSU library. For eastern Alabama residents, this is just across the state line / river from Phoenix City, AL. And there will also be a rally at some point at the Archives building in Morrow, Betsy! Thanks for letting folks know about this one! If they do close the Archives to the public, how will this affect the Virtual Vault, which is already having its problems? Maybe “Vanishing Georgia” was a foreboding title. Someday, I’m going to meet you in person and I’m going to look like a happy puppy with my tail wagging and I’m going to hug you and hug you and hug you!!!!!!!! Bless you for working so hard to keep educating and encouraging action! WOW, (b) is starting to sound like a strong possibility. We might have compare notes someday! Blind sided! I was so busy thinking about Georgia, I let that one slip right in. YEP, DNA makes sense!